Black Lives of Unitarian Universalism is excited to announce the newest addition to their Organizing Collective Board! Rev. Kimberly Quinn Johnson has been a long time supporter of BLUU, is a founding member of the BLUU Ministerial Network and led the youth programming at the first BLUU Convening. Rev. Kimberly Quinn Johnson serves as minister of the Unitarian Universalist Congregation of the South Fork, on Long Island in Bridgehampton, NY. She has passion and expertise for racial justice work and ministry with youth. Before ministry, Kimberly worked as a union organizer with the UAW. She also taught Women's and Gender Studies at New Jersey City University. Kimberly serves as chair of the UUA Appointments Committee and President of the Metro NY UUMA Chapter. She is also a member of the Central East Region Congregational Life Advisory Council and the Steering Committee for UU Class Conversations. 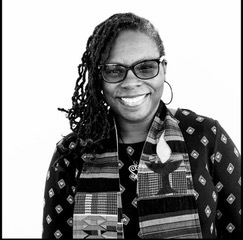 She gets to work in the nexus of faith formation, youth ministry, and racial justice as a Program Leader with the UU College of Social Justice. And she's likely to be spending her summer working with youth through UU Summer Seminary or Thrive, leadership experiences for youth of color. On the weekend of April 28, 2018, BLUU will be hosting RECLAIM., a revival of body, mind, and spirit, in Kansas City, Missouri! This will be a special moment for Black UUs and UU-adjacent folks, local Black organizers, and the communities they hold dear to connect, worship together, and support one another. Black Lives of UU Executive Director Lena K Gardner recaps #BLUUGA2017! The Black Lives of Unitarian Universalism Organizing Collective is proud to publish our full schedule for this year's General Assembly. In addition to programming inside the Explicitly Black Healing Space run by the BLUU Ministerial Network, the schedule includes a joint worship service with DRUUMM, several workshops, a plenary session in the main hall and an opening reception on Wednesday evening opening the Healing Space. We are pleased to offer this short update and follow up from the Black Lives of UU 2017 Convening - UUA Presidential Forum. Candidates Rev Susan Frederick-Gray & Rev. Alison Miller kindly provided written responses to several Black UU submitted questions that we were not able to cover in New Orleans in March. **NOTE: Rev Jeanne Pupke provided her responses to the Black Lives of UU Team on May 26. We post and share them here as a courtesy. Watch the full recording of the initial forum at the bottom of this page and click below to access the written responses to the additional questions. Moderators Dr. Takiyah Nur Amin & Dr. Royce James are joined by all three candidates for UUA President, Rev. Susan Frederick-Gray, Rev. Alison Miller & Rev. Jeanne Pupke for a historic Presidential Forum. Attendees were able to submit questions ahead of time and onsite. Our ask is a simple one: For each congregation participating in the #UUWhiteSupremacyTeachIn to join us in donating $5,000 to the National Mamas Bail Out Day.